Within the ancient teachings of Tibetan Buddhism lies a meditation tradition for facing – and dissolving – our greatest fears and attachments in life. Now one of contemporary Buddhism’s most experienced and respected teachers, Tsultrim Allione, adapts this practice to the challenges unique to our time, on Cutting through Fear. Based on the traditional Tibetan practice of Chod (literally “to cut”), this method was developed by a legendary Tibetan yogini, Machig Lapdron, almost 1,000 years ago and is practiced within all schools of Tibetan Buddhism. To this day, Chod is still used in Tibet to treat mental and physical illness and as a path to awareness. 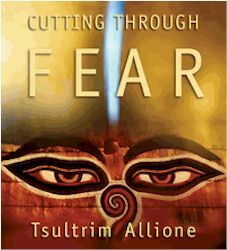 On Cutting through Fear, Tsultrim Allione shares the fascinating history of this practice, and interprets it especially for Western students of meditation and psychology. Drawing from root visualization practices, Tsultrim Allione shares a four-step process that can help you meet and release what the ancient Tibetans called “demons” – the fears, obsessions, illnesses, and hopes that can be faced and dissolved with this powerful meditation technique. We all encounter the demons of addiction, compulsion, anger, and other difficult emotions, too often as a daily event. Now we have a rare and useful tool to stop struggling against them, and instead liberate them, with Cutting through Fear. Tsultrim Allione, M.A. is an author, teacher, and founder of the Tara Mandala retreat center. Ordained as a Tibetan Buddhist nun in 1970, Tsultrim studied with H.H. the Dalai Lama, Kalu Rinpoche, Apho Rinpoche, Chogyam Trungpa Rinpoche, and other great lamas. She received her master’s degree in Buddhism / Women’s Studies from Antioch, and has taught at Harvard, Rutgers, Columbia, Smith, the Omega Institute, Naropa University, and Esalen. Tsultrim Allione is the author of the bestseller Women of Wisdom.